This is one of my favorite dresses to buy for the year. What’s better than picking out something flashy and adding your own touch to it? I’m talking sequins, sparkles, embellishments and metallics. I’ve put together a few of my favorite finds from around the web, enjoy: 1 // 2 // 3 // 4 // 5 // 6 // 7 If you’re doing a casual night, I would still suggest adding some sparkle. There is no reason to compromise your blang just because you won’t be booty poppin’ in da club. Opt for sparkly accessories. 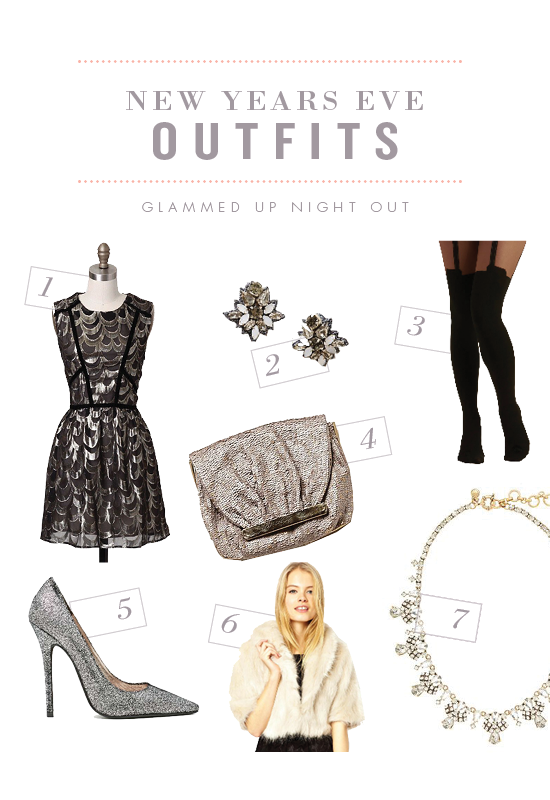 Try a sequins vest, scarf, metallic hair piece or purse. When it comes to glitzy accessories no one does it better than Ban.do, check them out here. If you’re going out to a fancy gig you’ll want to bring out the big guns. Why hold back? There is a way to do up a fun sequin outfit without looking over the top and goddy. If you’re wearing something super sparkly try adding neutral tones in the accessories. This also a chance to bring in another crazy pattern like polka dots or leopard. Night in with friends. Try doing a boyfriend jean with a sequin jacket. Or try a flashy shirt with a cotton basic top. You definitely don’t want to look like you tried to hard for this event. You’re already with your best pals. Best places to shop for new years dress? Boutiques. Boutiques. Boutiques. You want something unique and special that’s where to go. This year I’m really feeling the patterned sparkly dresses. Last year I did not buy a dress because I was on my ultra resourceful kick. This year I’m on my game. Hell it’s December 18th and I’ve already put together a post. You know on I’m on it! I even put together a Pinterest board for more inspiration, view it here. What I discovered: Anthropologie had the best glitzy purses. Modcloth & Urban Outfitters had the best dress selection. Shop Ruche had the best flashy skirts. Let me know what your going to be wearing for NYE 2014! I was just thinking that probably my NYE look will probably include PJ’s… so lame of me! I adore these options!! Sometimes you do need to get all fancy and go out! I love that dress! I never seem to get dressed up for New Years, but I want to this time! Agreed that even just a little sparkle is a must!